Sadie Black – yet to be visited by CTS – has won many friends down one end; at the other is super Polish shopping establishment Mitko Deli. 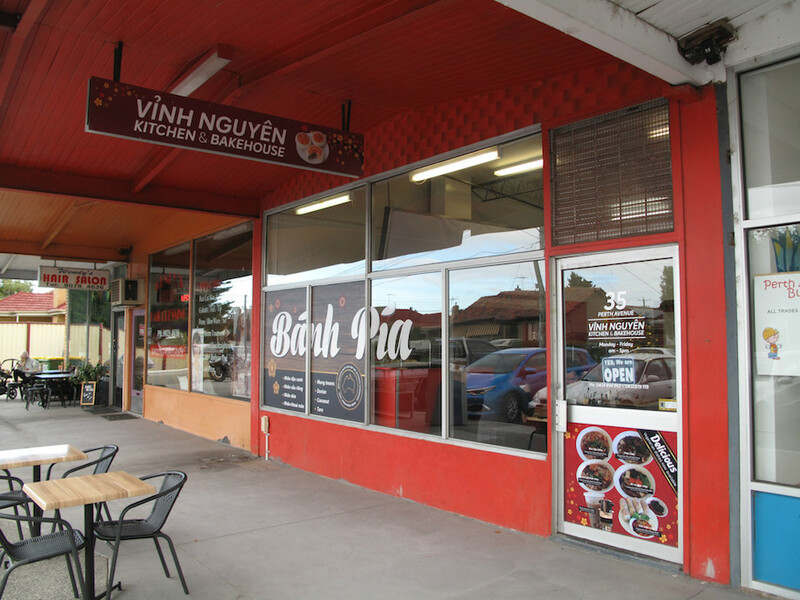 Right in the middle is Vinh Nguyen Bakehouse, which specialises in vegetarian Vietnamese food. 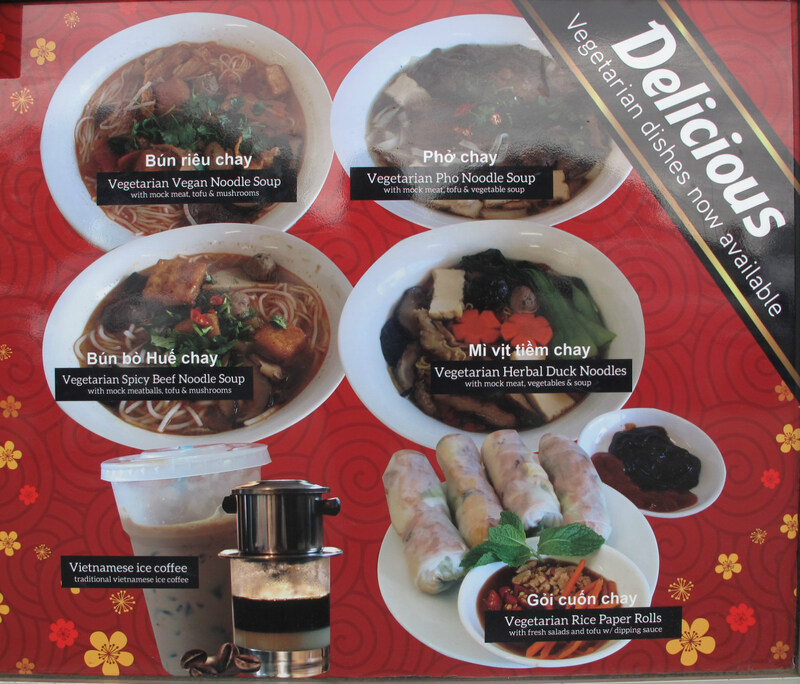 You can get imbibe of your actual pho here – but most of the soup/noodle dishes seem to be of other, different styles. 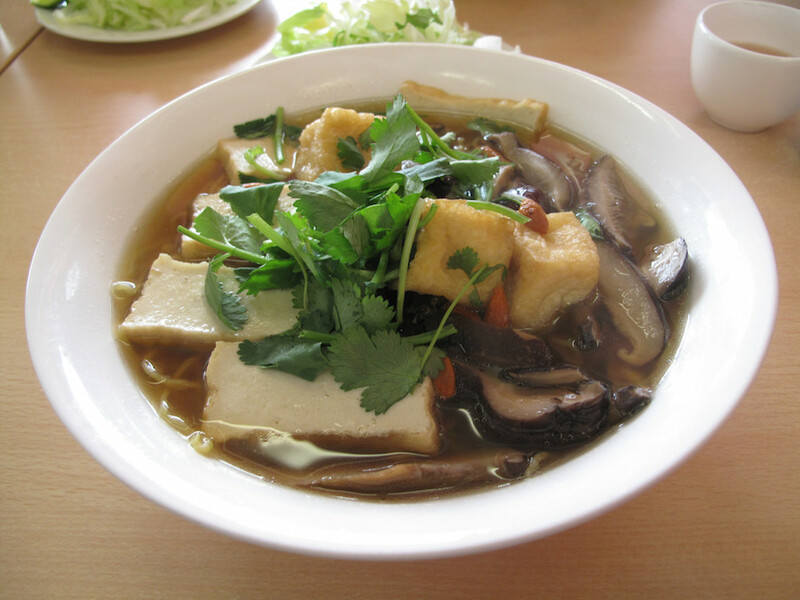 Not being a fan of mock meat, I plump for this nevertheless very nice concoction of egg noodles, vegetable stock, mushrooms and two kinds of tofu. It’s plain – in a good way! – that is lifted just right by a scattering of fresh chilli and lemon juice. 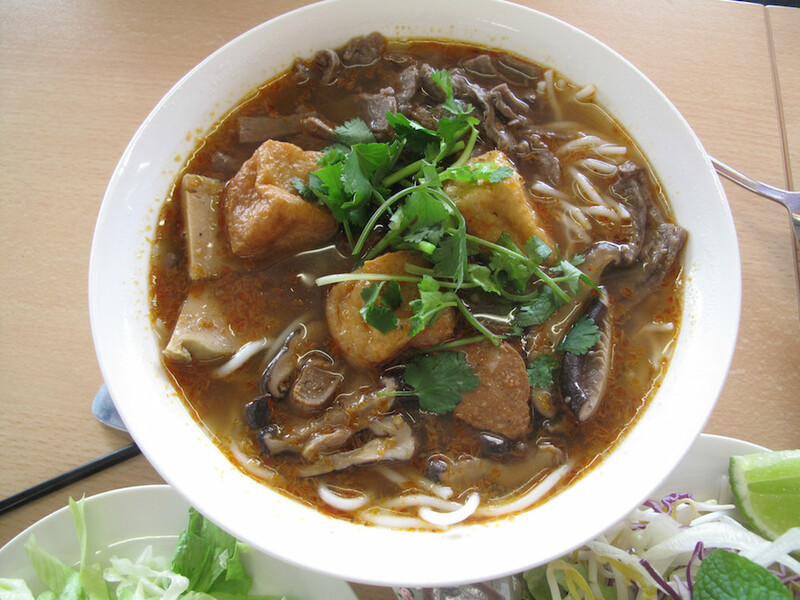 But a part of me rather wishes I’d gone in the direction of the bun bo hue advertised on the door! My dining companions – Virginia, Dinh and Annie – go for more complex arrangements on the same sort of theme, with mock meat fully present. 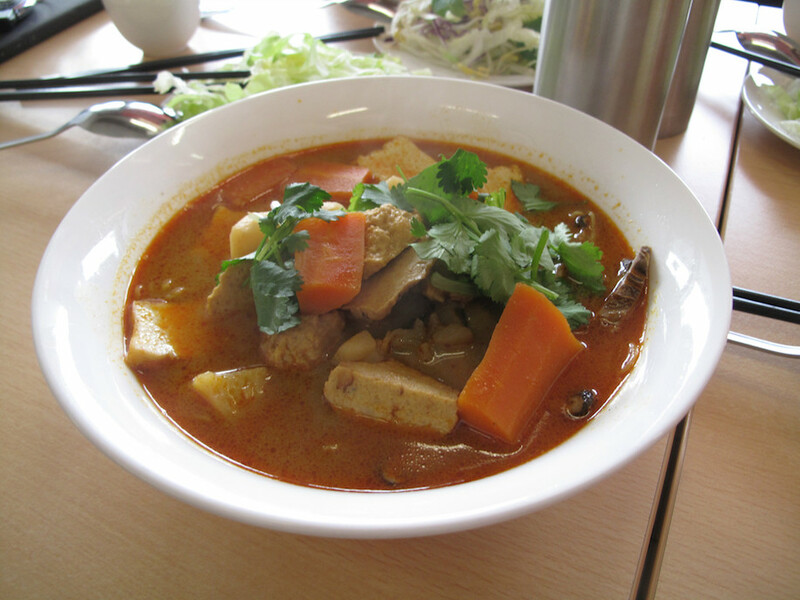 And even what seems to be a vegetarian rendition of bo kho stew. 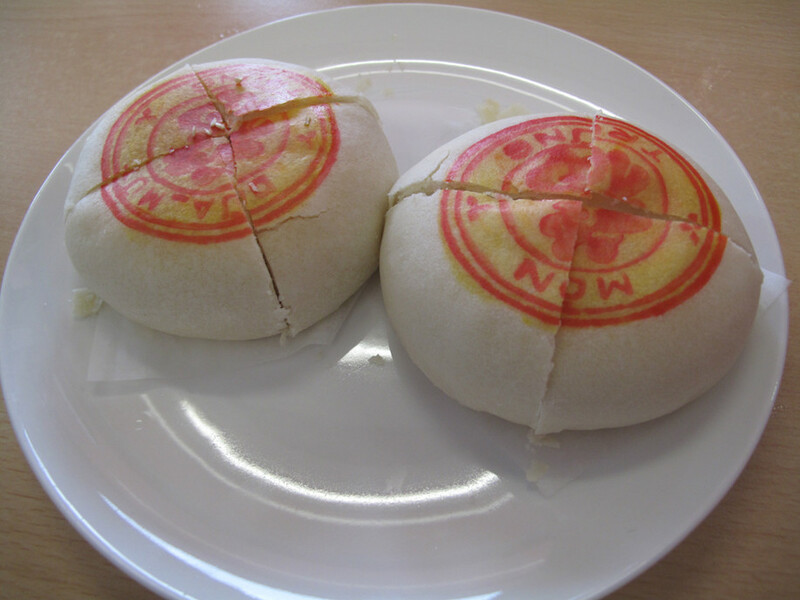 Vinh Nguyen Bakehouse specialises in pia cakes, which come in four flavours – taro, mung bean, coconut and red bean. These are really good – not too sweet, quite delicate, would go real fine with Vietnamese iced coffee. This joint is doing what I bet are excellent banh mi at the weekends. Recent Facebook posts have revved me up for a return, with a revolving line-up of specials that have included stir fried noodles, vegetarian bun bi vermicelli salad, spicy lemongrass noodle soup and mock duck/tofu rice paper rolls. How did you and your guests find the food here? It was very good, even if what I had was a little on the plain side. O do you mean, how did I actually find about the place? I was invited by a certain Brimbank councillor ..